KubeDirector is an open source project designed to make it easy to run complex stateful scale-out application clusters on Kubernetes. KubeDirector is built using the custom resource definition (CRD) framework and leverages the native Kubernetes API extensions and design philosophy. This enables transparent integration with Kubernetes user/resource management as well as existing clients and tools. We recently introduced the KubeDirector project, as part of a broader open source Kubernetes initiative we call BlueK8s. I’m happy to announce that the pre-alpha code for KubeDirector is now available. And in this blog post, I’ll show how it works. The ability to run non-cloud native stateful applications on Kubernetes without modifying the code. In other words, it’s not necessary to decompose these existing applications to fit a microservices design pattern. Native support for preserving application-specific configuration and state. An application-agnostic deployment pattern, minimizing the time to onboard new stateful applications to Kubernetes. KubeDirector enables data scientists familiar with data-intensive distributed applications such as Hadoop, Spark, Cassandra, TensorFlow, Caffe2, etc. to run these applications on Kubernetes – with a minimal learning curve and no need to write GO code. The applications controlled by KubeDirector are defined by some basic metadata and an associated package of configuration artifacts. The application metadata is referred to as a KubeDirectorApp resource. The KubeDirectorApp definition for the Spark 2.2.1 application is located in the file kubedirector/deploy/example_catalog/cr-app-spark221e2.json. The configuration of an application cluster is referred to as a KubeDirectorCluster resource. 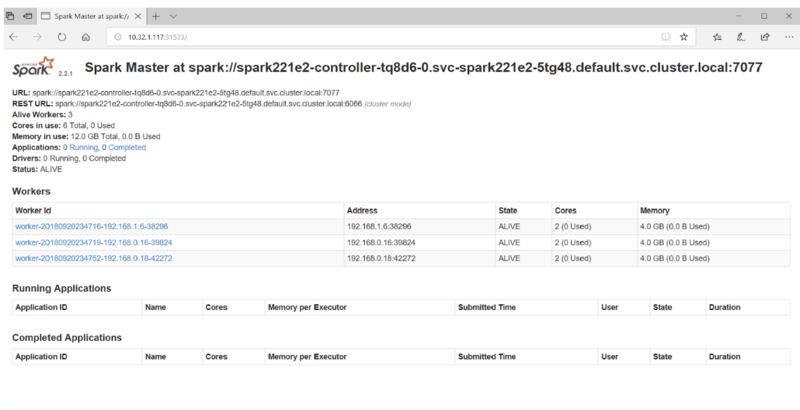 The KubeDirectorCluster definition for a sample Spark 2.2.1 cluster is located in the file kubedirector/deploy/example_clusters/cr-cluster-spark221.e1.yaml. With KubeDirector, it’s easy to run Spark clusters on Kubernetes. That’s all there is to it! In fact, in the example above we also deployed a Jupyter notebook along with the Spark cluster. Now you have a Spark cluster (with a Jupyter notebook) and a Cassandra cluster running on Kubernetes. Use kubectl get service to see the set of services.